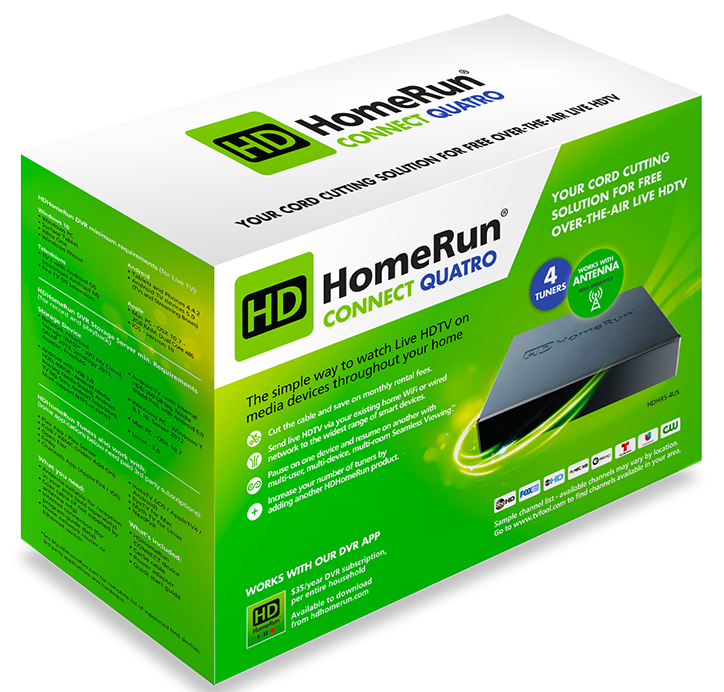 So I took the plunge and invested in one of these so-called cord cutting devices my choice being the HDHomeRun CONNECT Quatro. 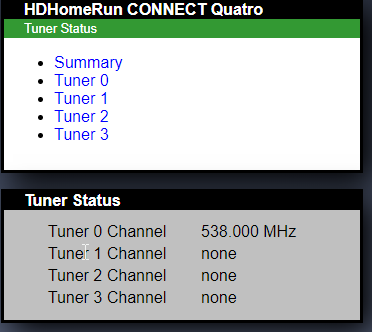 Quatro meaning 4 tuners I use plex a lot so thought it would compliment it well. Having received the box I started to unpack and connect to my aerial and router with the supplied ethernet cable. The Back of the Quatro is pretty simple not much to mess up here decided to connect it right near my aerial (coax) and router out the way and unseen. Then connected the power easiest set-up I have experienced. The first thing to do once when everything is set-up is goto http://my.hdhomerun.com/ through a computer or mobile device this will start the setup and you should see a webpage showing your device name and firmware version clicking the name of your device brings the picture underneath. 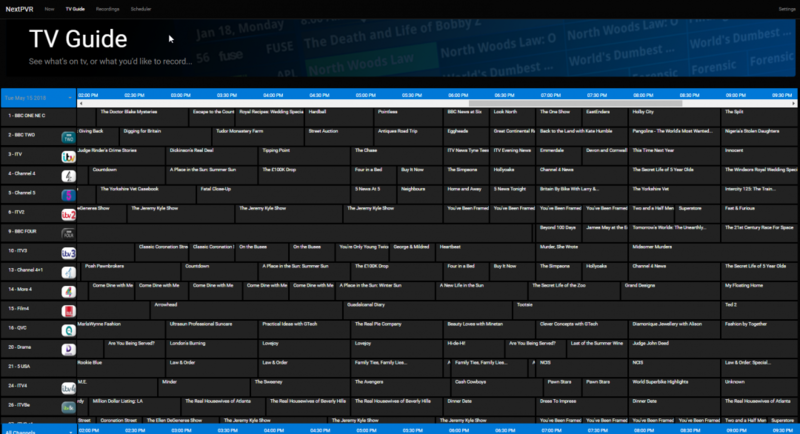 Clicking the channel lineup will start the process of adding your local tv channels if you don’t get many or no channels you can check the next section because there maybe a problem with your signal. So in tuner status you will be presented with your 4 tuners and a summary which will show you which tuner is being used and active. 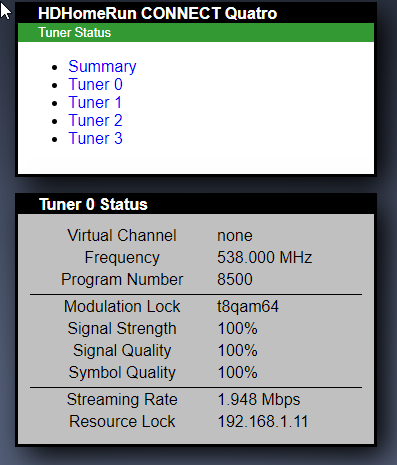 My active tuner which is Tuner 0 once clicked will show the following data, signal strength & quality being quite important here mine being 100% should mean I get a decent picture. It also shows more important data here stream rate and local ip its using. The last two options to are system status and install instructions, install instructions speak for themself. System status showing the following as well as a firmware update button. 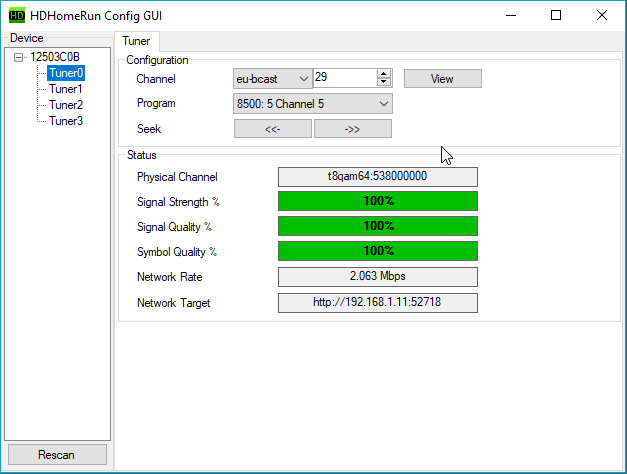 When you install the software if you go to where you have installed it for example for windows C:\Program Files\Silicondust\HDHomeRun you will find hdhomerun_config_gui.exe this can help with signal on different channels. Next if you have everything set-up you will be looking at what device you can use on and is it any good as the device claims to come with quite a lot of compatibility. I have tried firestick generation 1 this was my first choice and ran into a problem due to gen1 hardware there was no deinterlacing so the picture had lines on fast movement making it awful to watch on my tv. There is no fix for this so be warned you will not be impressed with the results. My tv is not android so could not get to work with homerun! I was stuck running it on my pc using the default windows homerun app (picture underneath) I installed nextpvr on my server and used this to record my shows as you have to pay a subscription fee to use the supplied hdhomerun app to record which is a big miss for quite and expensive box and was pretty annoyed about but nevertheless nextpvr is a solid good app and hasn’t missed a beat once recorded I transfer them to plex to watch on my tv. The final thing I done was shelled out for a decent player! I bought it to watch live tv also and the firestick was not good enough so I twisted my girlfriend’s arm and bought myself a Nvidia Shield this was a game changer it came with a live tv program pre-installed (picture underneath) and worked out the box connecting to the hdhomerun it works very well with epg. This I think is the best combination but expensive it can also do other stuff as its android my favourite being stream games from my computer. 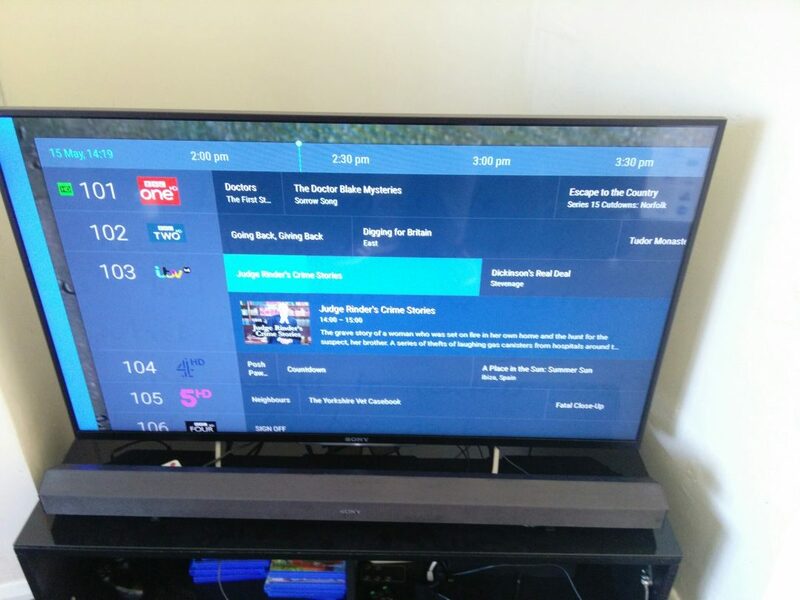 This is currently the way I am using hdhomerun to record and watch tv using the shield and nextpvr to record to plex for later watching I find it to be great this way and plan on buying a few amazon firetv 4k sticks when the price is right for other tvs in the house as thew have better hardware to sort the deinterlacing out. I also tried kodi as a pvr and it came out pretty well but have no need with the shield. I also use a plex plugin so once you have recorded the show it will be readable by plex to correct the season and episode see the link above for more details on that. Let me know your set-up I would be interested to see how you use it if you already own one? Overall I am happy with my purchase I can record tv shows and bring them anywhere I want through plex what’s not to like? The main downsides is its an expensive set-up and can be problematic on first set-up mainly the software side of things getting the right balance between players and servers is about the hardest thing .